Life for people of flood-affected areas in Bhadrak district continues to be affected in the absence of electricity, medical facilities and drinking water. BHADRAK: Life for people of flood-affected areas in Bhadrak district continues to be affected in the absence of electricity, medical facilities and drinking water. While roads in many areas are submerged, cooked food does not reach all the affected villages. 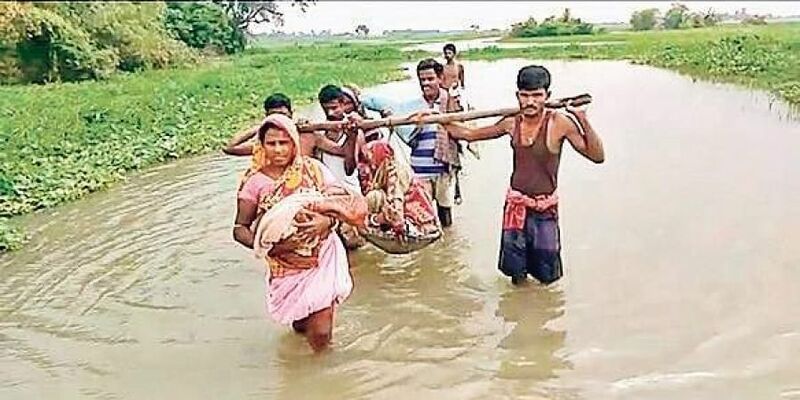 On Tuesday, a 22-year-old pregnant woman Sanjulata of Rampur village under Chandbali block was carried to Moto Primary Health Centre on a sling as no vehicle or ambulance could reach the waterlogged village. After delivering the baby, the mother and child were brought back to the village in the same manner. Flood water has paralysed life in Rampur village and 15 villages under Chandbali block for the last five days. While ailing villagers are finding it difficult to avail healthcare at health centres, students are unable to go to schools, which are waterlogged. Daily wagers have been without work for several days now. Sources said 10 schools in Chandbali block have been closed due to floods. The only ayurvedic hospital in Chandbali has also been marooned and patients are being treated under a tree, said Aravind Padhi, sarpanch of the block. Reba and Kapali villages under Dhamnagar block are also marooned. The villages are home to over 1,000 people, who have taken shelter in public buildings and schools. Hundreds of hectares of vegetable crops grown in these villages have been damaged. District Emergency Officer Jayshree Senapati said cooked food is being provided to flood-hit villagers.